For years now Mike and I have been waiting for the right time to get a pet and after finally moving in to our beautiful new home we decided that now was the time to add to our little family. Meet Cleo (or Neutrostar Tickled Pink if you want to be fancy!) our gorgeous little monster. 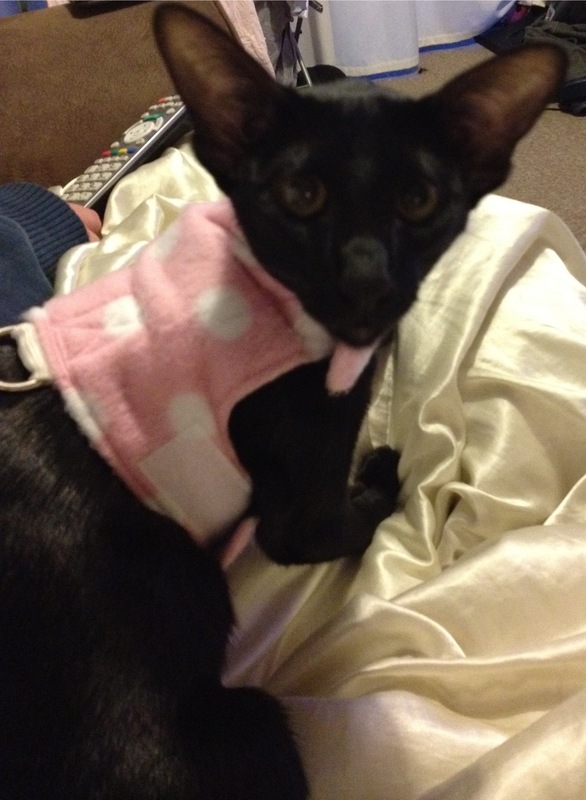 Cleo is an Oriental Shorthair, which is basically a Siamese without the infamous colourings. All my life I’ve had adopted pets, from the cat who appeared at our caravan whilst camping (and never left!) to the horses without riders, with whom there have been many. I’ve loved each and every one of them and the fresh start my family and I have been able to give them, so I must admit it felt a little odd to be visiting a breeder and homing a kitten who wasn’t in need. There was however a very valid reason as to why we chose a pedigree breed, and in particular an Oriental Shorthair and that is that I am highly, highly allergic to fur (or more specifically pet dander and specific proteins found in saliva). For some reason, Orientals produce less of the protein that turns me into a red-eyed, sneezing mess, making owning a pet a pleasurable experience once again. Though if you’re a fellow allergy sufferer don’t expect this to help build your tolerancy to other furry friends, I am still a sneezy mess around other people’s pets. Anyway, serious thoughts aside, I thought I’d pull together a list of the 10 8 things I’ve learnt since becoming a mummy slave to Cleo. Ok ok, so this was meant to be 10 things I’ve learnt but around point 5 I ran out of puff so this is now 8 things I’ve learnt since becoming mummy to an Oriental Shorthair. It’s been a month since we brought Cleo home and already she’s stolen Nectar point vouchers, the car keys, countless pants and socks, a MAC lipstick, 2 DVDs, half a sweet potato, a pair of Topshop shorts and some cat treats. In short, we’ve quickly learnt that nothing is safe in our house, even if it’s tucked away in a child-locked cupboard. On Friday morning I was awoken by a kitten scurrying across my face. This isn’t an unusual occurence, in fact it happens most mornings. What was unusual was that her paws were soaking wet. I assumed she’d been playing in her water bowl, or at worst knocked over a glass of squash. Unfortunately what our delightful bundle of fur had actually done was much worse, having just used her litter tray she decided to prance across my face with her urine soaked paws. This would have been bad enough, but as soon as I got cleaned up she immediately sneezed right in my face. Such a lady…NOT! With the typical British springtime well under way we have been forced to dry our clothes on an airer for the last few weeks. 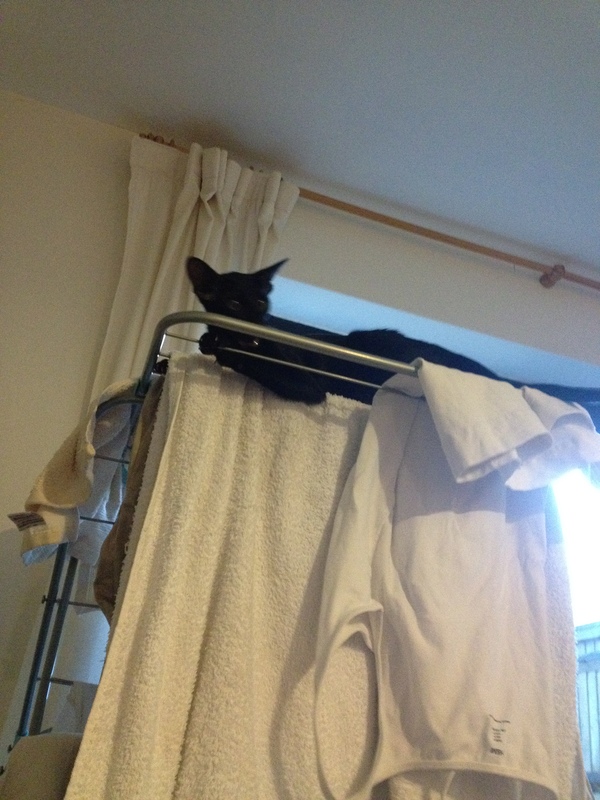 To most, it would be obvious that the purpose of the airer is to dry clothes, but not to Cleo! Through our cat’s eyes this is the perfect opportunity to improve her climbing abilities. If it weren’t so funny she’d have had a smacked bum, but it’s near impossible to tell her off when I can barely stand through laughter. With big ears come big responsibilities. Within a week of bringing Cleo home we discovered a lump on her jawline and after 24 hours of worrying we took her to the vets only to be told she had a swollen lymph node due to her lack of aural hygiene. We were packed off with some ear drops and a hefty £50 bill. This was 2 months ago and she still hasn’t sussed out how to clean her own ears properly. Thankfully we’re now down to cleaning them only once a week, but we’re still nowhere near having an independent kitty. Truth be known we’ve wanted a Puggle for a good long while, or any dog for that matter, but our lifestyle just doesn’t afford us the luxury of a canine companion just yet which is why we got a cat (just don’t tell Cleo that!). When it came to cats I just knew the Oriental Shorthair was the breed for us, but Mike needed some convincing which is where Beeker came in. The video of him playing fetch had Mike sold on the idea, despite their “ugly” appearance. If you’re left wondering whether you’re ready to hear the pitter patter of tiny human feet, I highly recommend you get an Oriental, trust me after a week with a baby Oriental you’ll be reconsidering any such thoughts! And if that hasn’t put you off you’ll struggle to get a moment of privacy. That said, if you can get past their neediness the bond you form with an Oriental is like nothing you’ll have ever had before. Cleo is like having a super furry, highly loving child and we love it that way, but if you’re after your usual independent kitty keep on looking as that’s not what you’ll get with this breed. My, what a big face you have! When I was 17 I got a Burmese x moggy from a rescue centre, he was the love of my life until like all young love, university got in the way. Off I went to Uni leaving him home with Mum and when I finally graduated Mum was so attached to him we agreed that she should keep him. Up until two months ago he looked like your standard cat, but since Cleo has come along he looks like an absolute beast. In fact, Mike actually asked whether I thought my parents had accidentally killed Kai and replaced him with a giant cat. We’ve quickly learnt that no cat will ever look normal again. I am the cat lady! What? Me? Trust me, you may not think you could ever become a crazy cat lady but sooner or later this one will sneak up on you until you find yourself sat in a trendy wine bar telling an old friend how “it’s so cute” that your kitten refuses to let her paws touch the cat litter when using the litter tray or that she has weird tickle spots that make her stick her tongue out. I’m afraid folks, I am now that girl, feel free to avoid me at social functions! 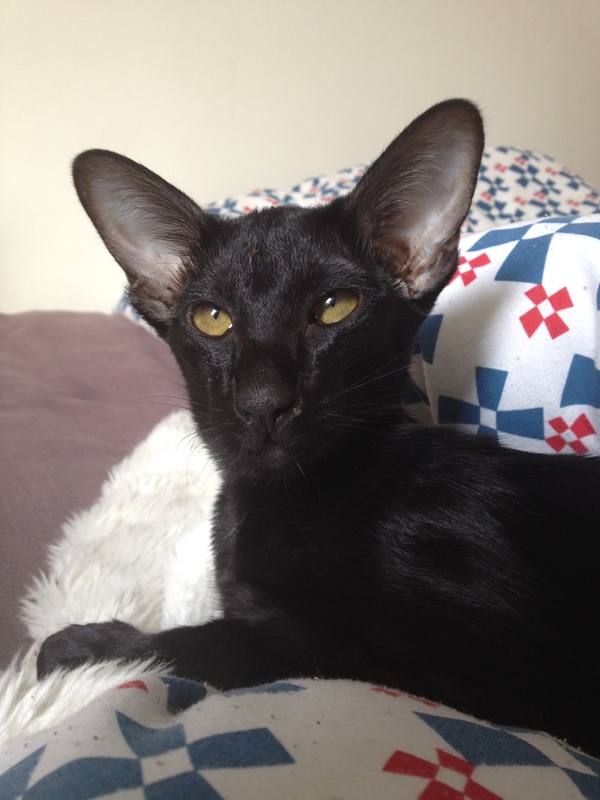 Feel free to get in touch if you want to know more about Oriental Shorthairs.